Loyal readers will recall that there are 25 trees total in this micro-orchard, a small recreation of the much larger Peirce Orchard that existed in the 19th century. In April 2017 there were a total of 12 flowers on just three (3!) of the trees, indicating that there was trouble in paradise. A grand total of five (yes 5!) pieces of fruit were produced. The challenge was then, and is still, to revitalize the soil with plant-supporting nutrients and biological activity. In some areas of the fenced-in area the challenge was actually to create carbon-rich soil on top of gravelly landfill. Things were looking hopeful in November 2017 as the winter cover blanket was being woven in advance of Winter’s onslaught. Fast forward five months and the great news is that the cover did it’s job, much to joy (but not surprise) of orchard-master Tim Makepeace (pictured blow with signature Amish hat). 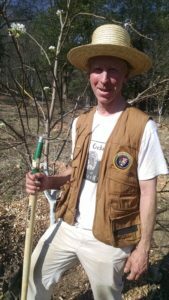 Tim recently wrangled a number of us volunteers on a hot Spring day to clear away the Winter cover, chop out some pesky crab grass, spread tons of mulch, and generally prepare the area for the Spring and Summer plant cover. It was hard, sweaty work but worth the effort, since the soil around a number of the trees was looking much darker, indicating moisture and tree-friendly microbial activity. And at least eight of the trees were in full flower riot, with too many blossoms to count! When these pedals drop they will just be adding organic material to the soil, accelerating the revitalization process. Once room was cleared Tim then started to lay down seeds for the Spring/Summer cover. This collection of plant and grass species is designed to work together to protect, nurture, and fortify the soil layer for the benefit of all non-pesky plants (including the trees). Similar to the Winter cover, Tim’s collection of seeds included about 20 different species, such as mustard grass, vetch, and clover. What, you might ask, is the connection here with ForestPlanet, an organization that helps plant trees in (say) Madagascar? Again, both organizations recognize that trees can help revitalize soil, and that healthy soil supports the trees…no matter the continent. Our next installment in this series can be found here.